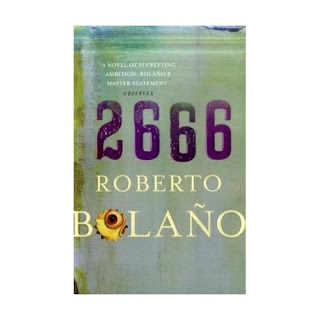 Roberto Bolaño’s 2666 is an obsessive and world-shifting epic. When I read it, I will be completely absorbed by it. It will be all I think about. It will affect my daily life in ways I can’t fully understand, and when I finish it I will have come to profound revelations about the nature of existence. contains all possible characters, styles, genres, turns of phrase, metaphors, speech patterns, and profound life-changing revelations. An unread book exists only in the primordial soup of your imagination, and there it can evolve into any story you like. An unread book – any unread book – could change your life. She goes on to imagine the possibilities of a handful of other novels she hasn't read. Apart from 2666, I haven't read them either. Yet, even though I have read all 893 pages of the British Picador edition and was absorbed enough to believe I would not forget each highway and byway of the long journey, I find that now, looking back from beyond the final page, all the roads have concertinaed to form an impenetrable block. Roberto Bolaño's 2666 has not affected my daily life, it has not caused any profound revelations, and the world remains unshifted. But for the complete absorption, everything of which Kirsty Logan dreams about 2666 didn't come pass, unless, that is, for all of its characters, adventures, ideas and slow-burning narrative tension, for all of its richness of colour and texture, the revelation is that the nature of existence will remain unclear and will never be resolved into coherence, not even in the most lengthy work of literature with all of its innumerable interconnections and possible all-embracing overall design. Of course, if this is the revelation, it is certainly not profound. As well as the encyclopaedic power to capture life, the aura of modern literature is borne on the promise of such revelatory exegesis in which something more will emerge, so one is bound to be disappointed. The persisting presence of an aura explains the range of readerly reactions from obsessive dedication of those who see revelation in the mathematical system underpinning Dante's Commedia to Book Groups chatting about "issues" in the latest Jodi Picoult unit. A banal point perhaps: the reader is always seeking more than the book itself. After all, it is a form of information storage and retrieval. With the incommensurability of modern literature, the violence of interpretation becomes necessary if it is to mean something other than an increasingly minor branch of the entertainment industry. It certainly needs to be forgotten in order to read. If we begin reading knowing incompletion will be the ultimate experience – perhaps even disharmony and disunity – then what are we reading for? We begin with the idea, as Kirsty Logan suggests, of the novel we are about to read as the Platonic Form of its kind, an ethereal presence in which all stories coalesce and conclude. Here it is, in our hands! So, when I say: "I've read Roberto Bolaño's 2666", do I know or care what I am referring to other than the same possible book Kirsty Logan has imagined? As I announce my reading, a whiff of cultural-oneupmanship begins to circulate. It alludes to secret knowledge, new power over those who have not read it and potentially over those who have read but have not comprehended its message. But I don't have that knowledge or power. What have I missed? Nabokov said that the second reading of a book is always the first. The first is a blind reading. You have to read the book a second time in order to have read it once. So perhaps I should re-read Roberto Bolaño's 2666 in search of a subtler experience in which the disparate details begin to reach out to one another more clearly and the revelations become more profound. However, if Heraclitus is right, then that second reading is impossible. The second reading will always be the first and therefore blind. The second reading will always be the book to come. I have not read Roberto Bolaño's 2666. I will never read Roberto Bolaño's 2666.